Electronic mail is one of “killer apps” of networked computing. The ability to quickly send and receive messages without having to be online at the same time created a new form of human communication. By now billions of people have used email. Email has a long and storied history, dating back to MIT’s Compatible Time Sharing System (CTSS) and the US government’s AUTODIN in the early 1960s. These early systems, which often used propriety communications networks and protocols, were generally incompatible with each other; you could only exchange mail with people using the same system. The first email on the ARPANET (the predecessor of today’s internet) was sent by Ray Tomlinson in 1971, and mail formats became standardized (RFC 524, RFC 561) soon thereafter. In the 1980s, the Post Office Protocol for TCP/IP codified the communication between email clients (which run on the user’s computer) and the email server (where messages are received from other systems and stored), so that there could be independent implementations of both on different computers and operating systems. 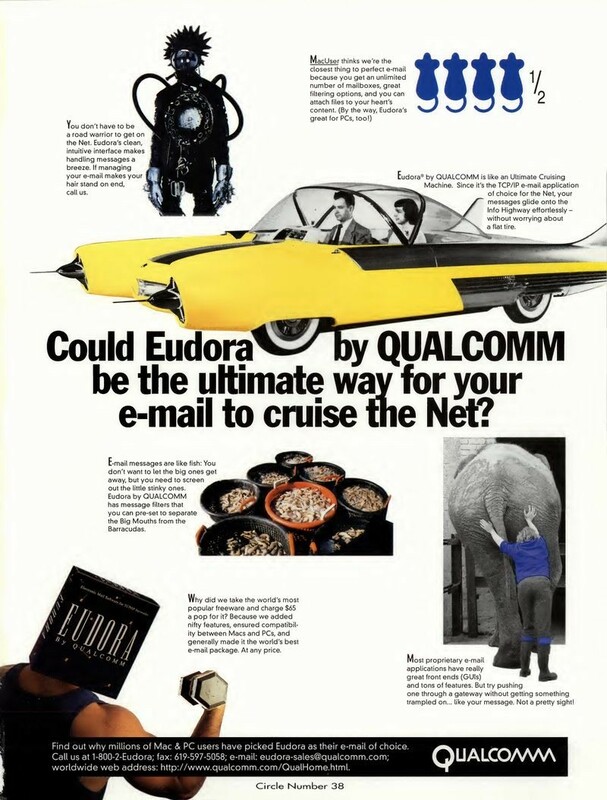 Eventually many email clients were written for personal computers, but few became as successful as Eudora. Available both for the IBM PC and the Apple Macintosh, in its heyday Eudora had tens of millions of happy users. Eudora was elegant, fast, feature-rich, and could cope with mail repositories containing hundreds of thousands of messages. In my opinion it was the finest email client ever written, and it has yet to be surpassed. I still use it today, but, alas, the last version of Eudora was released in 2006. It may not be long for this world. With thanks to Qualcomm, we are pleased to release the Eudora source code for its historical interest, and with the faint hope that it might be resuscitated. I will muse more about that later. In the 1980s, Steve Dorner was working at the computer center at the University of Illinois at Urbana-Champaign. It took Dorner just over a year to create the first version of Eudora, which had 50,000 lines of C code and ran only on the Apple Macintosh. Like many university-produced programs, it was available to anyone for free. In 1991, Qualcomm, a communications company in San Diego famous for CDMA cellular communications technology, licensed Eudora from the University of Illinois. Dorner was eventually hired by them to continue to develop it, working remotely from his home in Illinois. Qualcomm’s motivations were several. They knew that the internet would fuel the need for wireless data, and they thought that email would be one of the drivers. They also thought it prudent to diversify beyond ICs for wireless technology into software applications. 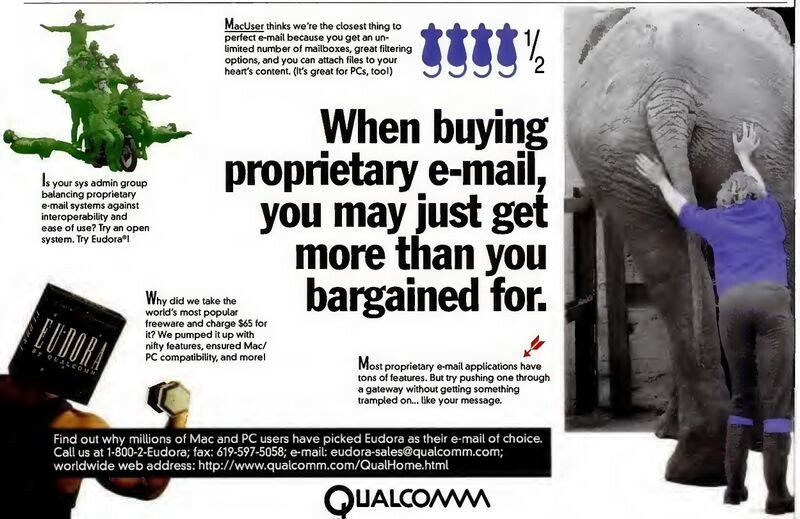 The company later said, “As a leader in developing and delivering digital communications, Qualcomm recognized email as an important communications tool for the future,” and they released it as a consumer product in 1993. The Eudora team at Qualcomm expanded quickly from the initial four to a moderately large product group, and at its peak was over 50 people. Eudora was soon commercialized as a paid version for $19.95. There was still a free version, now supported by advertisements. By 2001, over 100 person-years of development had been invested in the Windows and Macintosh versions. 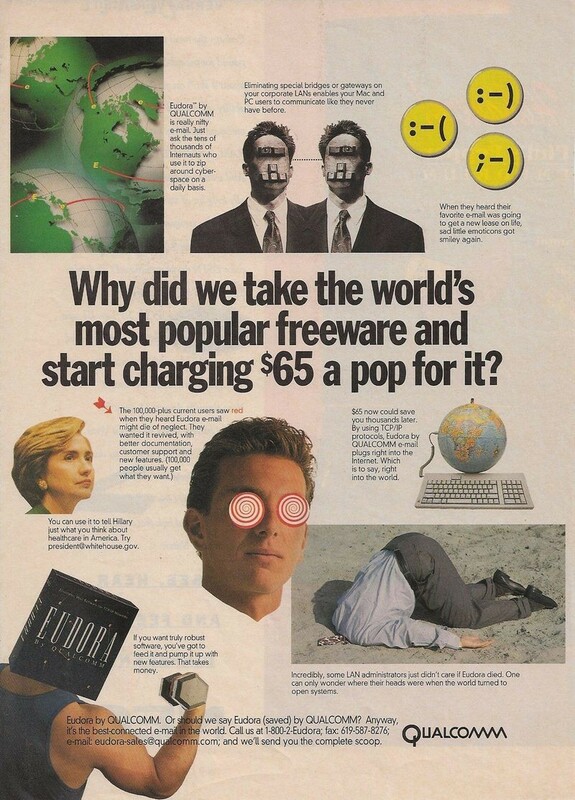 The paid version eventually sold for as much as $65, and it was aggressively marketed by Qualcomm. After 15 years, Qualcomm decided in 2006 that Eudora was no longer consistent with their other major project lines, and they stopped development. A likely factor was the increasing adoption of Microsoft Outlook as an email client for corporations. Outlook was preloaded for free on many PCs, and companies often standardized on it along with the rest of the Microsoft suite of office productivity products. Other free email clients were also available. So regardless of how successful Eudora was, it was never going to be a business big enough to “move the needle” for a company of Qualcomm’s size. The last Qualcomm versions of Eudora, 7.1.0.9 for Windows and 6.2.4 for Macintosh, were released on October 11, 2006. To provide a “soft landing” for the millions of Eudora users, Qualcomm generously sponsored the creation of a new compatible open-source version based on Mozilla Thunderbird. For some time they paid the salaries of the programmers working on it, which included Steve Dorner, Jeff Beckley, Dale Wiggins, Geoff Wenger, Matt Dudziak, and Mark Charlebois. A beta of the new version 8.0 was released in August 2007. But it was panned by the Eudora faithful, in part because it had both a different look and feel and an incompatible mailbox data format. The production version 1.0 of what was renamed “Eudora OSE” (Open Source Edition) was released in September 2010, but fared no better. After a few more years of intermittent work, the project for an open-source Eudora collapsed. The last Qualcomm Windows version of Eudora continues, with some glitches, to work well under Windows 10. The Apple Macintosh version, unfortunately, did not survive the transition to the modern Mac processors and operating systems, and can now only run using emulators. The discussion with Qualcomm for the release of the Eudora source code by the museum took five years. In the end, they decided not to simply grant a license, but to transfer ownership of the code, the Eudora trademarks, the copyrights, and the Eudora domain names to the Computer History Museum (CHM). The transfer agreement allows us to publish the code under the very liberal BSD open source license, which means that anyone can use it for either personal or commercial purposes. The Windows version of Eudora is written in C++. The source tree consists of 8,651 files in 565 folders, taking up 458 MB. There are both production (“Eudora71”) and test (“Sandbox”) versions of the code. The Macintosh version of Eudora is an entirely different code base and is written in C. The source tree consists of 1,433 files in 47 folders, taking up 69.9 MB. The license for the code allows you to use the code for free, with or without modifications, for personal or commercial use, as long as the copyright notices, the list of conditions, and the disclaimers are retained in the code. The license does NOT allow you to use any of the trademarks or domain names related to Eudora, including Eudora™, www.eudora.com, and www.eudora.org. 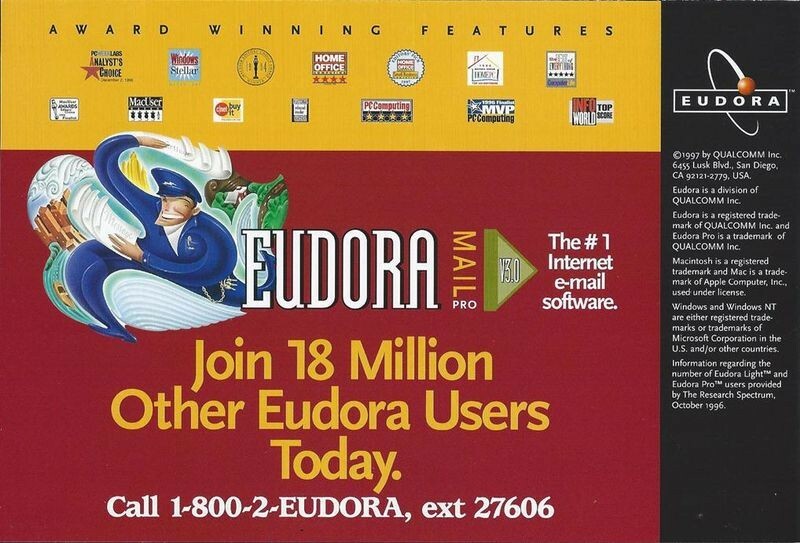 Although Eudora became unsupported as of 2006, some of us are in denial and still use it as our primary email client. I have over 350,000 archived messages in the Windows Eudora format going back to 1997, along with 28,000 embedded images and 33,000 saved attachments. I run it with only minor problems under Windows 10. I know of no other email client that can manage repositories that large and search them so quickly. I spend hours each day using Eudora to read and send email. I can do a complex search for anything in the 20 years of archived email in under a minute. It will be a sad day when I have to give it up. Are there others like me? We have no way of knowing how large the community of current Eudora users is. If you would like to contribute to a short informal poll about your current and past Eudora usage, please fill out the survey here. Are you a Eudora user, past or present? Participate in our survey! I do hope that someone, or some group, or some company, will adopt the Windows Eudora source code and revive it as a supported program. The Computer History Museum cannot do that. Only the Eudora fan base can. It won’t be easy. The tasks in reviving the Windows version include replacing several third-party libraries for isolated tasks, like spell-checking. The HTML rendering engine should be replaced with something more modern. The handling of Unicode and other special character encoding needs to be improved. Also, the Windows version uses a Qualcomm-modified version of RogueWave Software’s Stingray package of extensions to MFC, the Microsoft Foundation Class library for C++. After more than three years of discussion, we finally secured an agreement with RogueWave, giving us permission to distribute a binary linkable library compiled from the 20-year-old source code, but only for noncommercial use. That library is not currently part of this release, but we will build and distribute it if there is credible interest in rebuilding a noncommercial Windows version of Eudora. But it will take some effort to make the changes to the RogueWave source code necessary to compile it in a modern development environment, and we could use help in doing that. The Macintosh version, because it is based on an older processor and operating system, would be harder to resuscitate. It would have to be substantially rewritten for the current Mac environment. But not much is beyond the capability of motivated and clever programmers. Have at it. Thanks to Qualcomm, Wintertree, and RogueWave their various permissions. Thanks to Grady Booch, Steve Jasik, and Jennifer Stanley of Fenwick & West for their help. Thanks to Steve Dorner, Jeff Beckley, and John Noerenberg for their encouragement and participation in this multiyear odyssey to release the code, and for creating Eudora in the first place. You should be very proud of what you did. The reason for stopping to use it vary widely: not supported, won’t run on MacOS X, problems with Gmail, HTML issues, character set issues, company uses Outlook, lack of security, webmail is more portable, wanted Linux version, Apple mail got better, it began to feel dated. It was, and always has been my favorite e-mail client. I would use it in a heartbeat, if it were to come back to life! 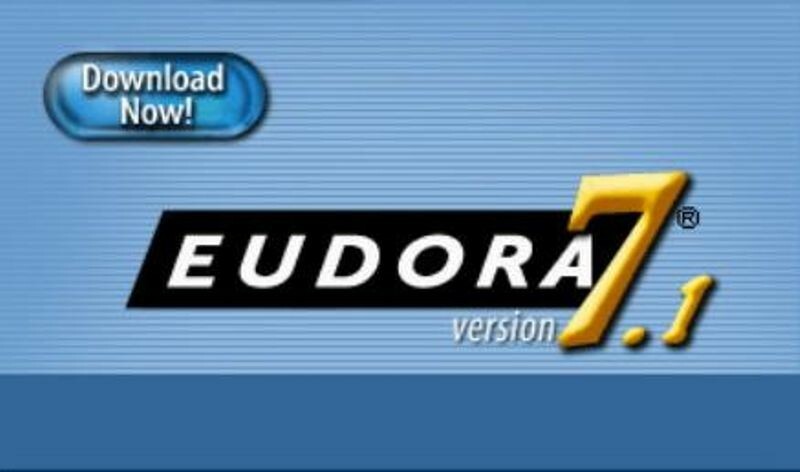 Eudora’s one of the very few bits of software I use every single day. There is nothing to be changed. It is the best software EVER, EVER, EVER. I don’t need the crap about groups and social media associations and other high tech sharing stuff. I want Eudora the way it has always been and especially the ability to look up an email from 1999 in 2 seconds with part of a keyword! This is a very old love affair with Eudora. I haven’t used it in a number of years, but can’t think of anything I’d change. Don’t know how to improve upon an already amazing program that I dearly wish was still available. I just would be happy if it continued to work as I knew it in the past! It’s what it had that I miss that bothers me, not what it didn’t have that I wanted.